Ever since moving to Florida two years back, I’ve dreamed about frequent weekend escapes to explore cities outside of my Orlando hub, but still within Florida. This summer, I finally found the time to make this happen. It began with a trip to Key West, followed by a weekend in Marco Island, and I’m excited to say it doesn’t end there. 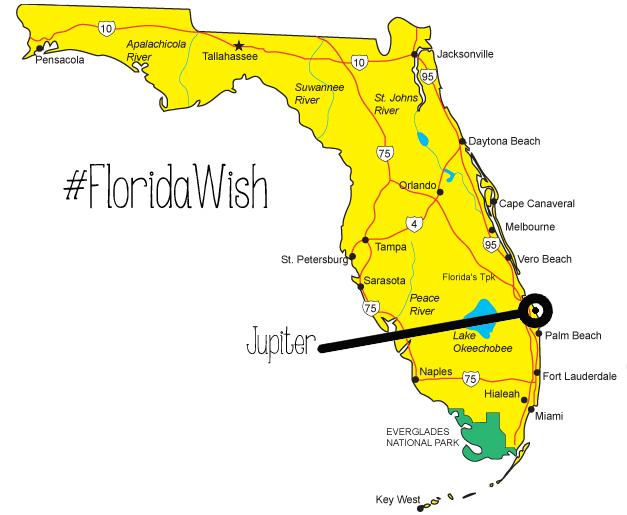 Next weekend a girlfriend and I are heading to the Jupiter/Palm Beach area as part of the Marriott ‘Wish You Were Here – Florida!‘ campaign. Jupiter is a town located in Palm Beach County, Florida. 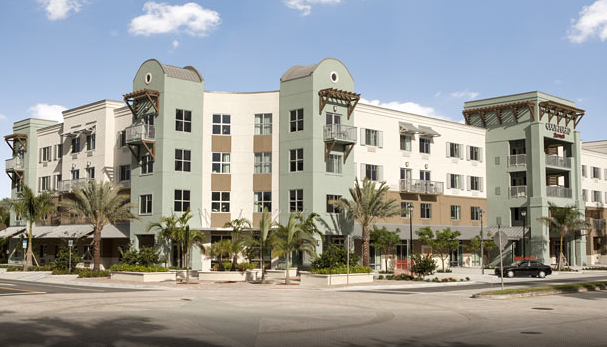 It is roughly a 2.5 hour drive south-east from downtown Orlando. In 2012, Jupiter was rated as the 9th Happiest Seaside Town in America by Coastal Living. A girlfriend and I will be spending two nights at the Courtyard Palm Beach Jupiter. 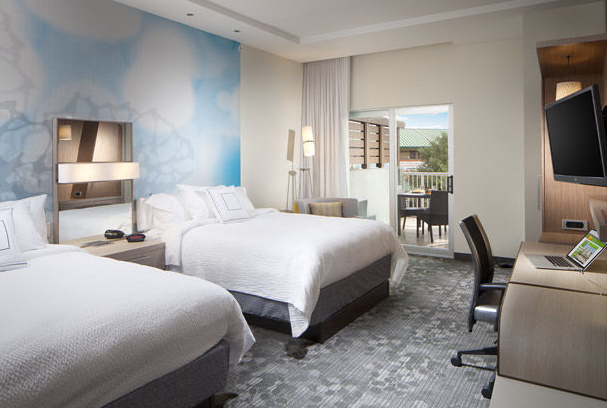 The hotel only recently just opened and is one of the first Courtyard hotels in Florida to feature Marriott’s new Cynergy design. Cynergy incorporates sophisticated details into functional spaces. a) It’s brand, spankin’ new! c) Large fitness center overlooking the outdoor pool. d) The hotel and the rooms feature ample electrical outlets – perfect for charging myMacBook, DSLR, iPhone and GoPro simultaneously! I always get excited when a hotel room has a ton of electrical outlets; especially when there’s one built into the bed-side lamp, those are my favorite kind! Technology has definitely changed the way I travel, so it’s nice to see a hotel addressing the ‘next gen/millennial’ market. Mangroves & Manatees tour with Jupiter Outdoor Center: This is a 90 minute tour that seeks out manatee sightings and explores the local mangrove-lined waterways of the lower Loxahatchee River and Indian River Lagoon. We’ve chosen the stand-up paddleboarding option for this, but you also have the option to kayak instead. 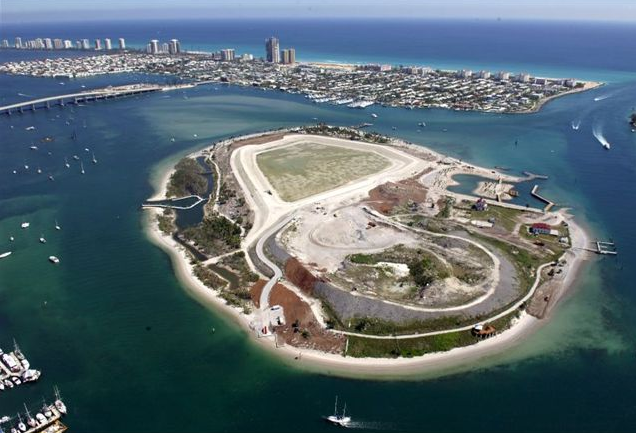 Peanut Island Adventure with Visit Palm Beach: We’ll be kayaking across the crystal clear waters of Lake Worth Lagoon to Peanut Island (image below) at our own leisure. Once there, we’ll have plenty of time to explore the man-made island, snorkel the incredible Snorkeling Lagoon, have a picnic lunch and soak up the sun! What I’m most excited about though… playing with my new GoPro! I’m super keen to take it out on the water and get some wicked photos and videos while we kayak and paddleboard! Stay tuned for a post-weekend getaway review on the blog when I return! 1) Is there anything else in the Jupiter/Palm Beach area that I just can’t go without seeing/doing? 2) Where are you heading this summer? *Courtyard Marriott Palm Beach Jupiter is providing me with a complimentary two night stay, but all opinions are my own. I’m so excited to see your Go Pro photos! I’ve actually never been to Jupiter/Palm Beach so I don’t have too many recommendations, but I can’t wait to see your recap for future ideas! … if I ever figure out how to get the GoPro out of the packaging… Haha. Sounds like a great itinerary. I would recommend visiting Blowing Rocks. It’s a beautiful place for photos. It’s a mile long trek of lime rock formed by the pounding ocean waves. Prepare to get splashed. I do remember briefly reading about ‘Blowing Rocks’ while looking into where to go! If it’s a great photography place, I definitely need to check it out – and if we’re bound to get splashed, all the more fun for my new GoPro!! !